The key concepts of the book are introduced—professionalism, professional learning and teacher expertise. A survey of teacher policy in the UK and NI in early 2000s provides a backdrop to the discussion of the drivers of teacher policy currently. The chapter considers the way in which national teacher policy interventions are shaped by international comparisons and in particular the role of the OECD and the International Summit on the Teaching Profession. 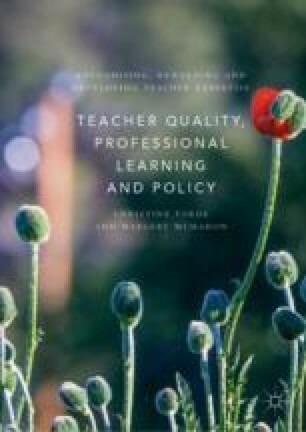 The chapter concludes by arguing that in order to improve teacher quality and develop accomplished practice we need to enhance teacher expertise through career-long professional learning. Ainley, J., & Carstens, R. (2018). Teaching and Learning International Survey (TALIS) 2018 Conceptual Framework (OECD Education Working Papers No. 187). Paris: OECD Publishing. https://doi.org/10.1787/799337c2-en. Barber, M., & Mourshed, M. (2007). How the World’s Best-Performing School Systems Come Out on Top. New York: McKinsey. http://www.mckinsey.com/clientservice/social_sector/our_practices/education/knowledge_highlights/best_performing_school.aspx. Callaghan, J. (1976, October 18). A Rational Debate Based on Facts. Oxford: Ruskin College Speech. http://www.educationengland.org.uk/documents/speeches/1976ruskin.html. Darling-Hammond, L., & Rothman, R. (2011). Teacher and Leader Effectiveness in High-Performing Education Systems. Washington, DC, USA: Alliance for Excellent Education and Stanford, CA: Stanford Centre for Opportunity Policy in Education. https://www.researchgate.net/publication/234763642_Teacher_and_Leader_Effectiveness_in_High-Performing_Education_Systems/download. Forde, C., & McMahon, M. (2011). Accomplished Teaching, Accomplished Teachers in Scotland: A Report Submitted to the Review of Teacher Employment in Scotland. Glasgow: University of Glasgow. http://eprints.gla.ac.uk/61304/. Hutchings, M., Mansaray, A., Minty, S., Moreau, M. P., & Smart, S. (2009). Excellent Teacher Scheme Review. London: London Metropolitan University. http://www.education.gov.uk/publications/eOrderingDownload/DCSF-RR137.pdf. OECD. (2000). Knowledge Management in the Learning Society. Paris: CERI, OECD. http://ocw.metu.edu.tr/file.php/118/Week11/oecd1.pdf. OECD. (2007). Quality and Equity in Schooling in Scotland. Paris: OECD. http://www.oecd.org/unitedkingdom/reviewsofnationalpoliciesforeducation-qualityandequityofschoolinginscotland.htm. OECD. (2009a). Creating Effective Teaching and Learning Environments: First Results from TALIS. Paris: OECD. https://www.oecd.org/education/school/43023606.pdf. OECD. (2009b). Evaluating and Rewarding the Quality of Teachers International Practices. Paris: OECD. https://doi.org/10.1787/9789264034358-en. OECD. (2011). Innovative Learning Environment—A Leading OECD/CERI Programme. Paris: Centre for Educational Research and Innovation. http://www.oecd.org/education/ceri/innovativelearningenvironments.htm. OECD. (2014). Improving Schools in Wales: An OECD Perspective. Paris: OECD. http://www.oecd.org/education/Improving-schools-in-Wales.pdf. OECD. (2015). Improving Schools in Scotland: An OECD Perspective. Paris: OECD. https://www.oecd.org/education/school/Improving-Schools-in-Scotland-An-OECD-Perspective.pdf. OECD. (2016). Governing Education in a Complex World. Paris: OECD. http://dx.doi.org/10.1787/9789264255364-en. OECD. (2018a). Programme for International Student Assessment: What Is PISA? Paris: OECD. http://www.oecd.org/pisa/aboutpisa/. OECD. (2018b). Education at a Glance 2018: OECD Indicators. Paris: OECD. https://doi.org/10.1787/eag-2018-en. Scottish Government. (2016). National Improvement Framework for Scottish Education: 2016 Evidence Report. Edinburgh: Scottish Government. http://www.gov.scot/Resource/0051/00511488.pdf. Scottish Government. (2017). Education Governance Next Steps: Empowering Teachers, Parents and Communities to Achieve Excellence and Equity in Education for Our Children. Edinburgh: Scottish Government. http://www.gov.scot/Resource/0052/00521038.pdf. World Bank. (2016). SABER Systems Approach for Better Education Results. Washington: The World Bank. http://saber.worldbank.org/index.cfm?indx=5.